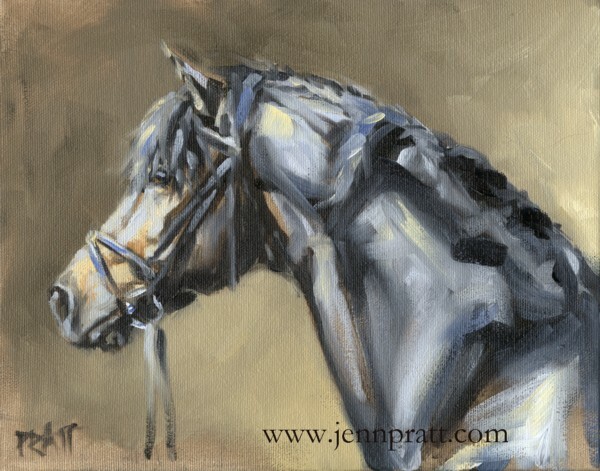 Studio Forecast for 2011 is Bright..with a little bit of Pink | Jennifer Pratt Equine Artist. It’s that time again, the New Year blog post. The last two years, I’ve made some big announcements on where my artistic focus is headed for that year. Two years in a row, I’ve stuck to my word. I believe that it is this post that keeps me accountable in my actions the remainder of the year. 2009 it was Let’s Reminisce, where I announced my medium shift to Oil. A big undertaking considering at the time, I had only been painting in Oil for 4 months. 2010, came with a determined statement to stay focused. I coined a title for myself; ‘Mountaineer’. I envisioned a year of a slow yet steady, methodical climb up, both personally and professionally. I’m happy to say, I feel that I’ve found a very good groove in my daily routine as an artist and achieved some remarkable goals over the past year. Let’s start by reviewing a few highlights from 2010. Without a doubt in my mind, my trip to Sweden last year was my biggest undertaking of 2010. I took a chance and it paid off in more ways than one. I got in touch with a long-lost adventure seeking side of me. I was reunited with that exhilarating feeling of experiencing new worlds afar. I met the kindest people on Earth; my new Swedish friends Maria, Ida and Sofie. I came home to produce my favorite painting of 2010. That of the little pony that could; Polsbury Palermo RNF 178, aka Pallie. This was the first painting I created when I returned home from Sweden. Yes, it’s simple and small but came to me quite smoothly. There is a liveliness and freedom to the brushwork and it certainly captures Pallie. To me, this little stallion and his painting represents all that my trip to Sweden was: Taking a chance, working toward a seemingly impossible goal and a positive outcome of a job well done. Pallie is not all that different, given this pony has beaten all odds in surviving a tragic accident involving a motor vehicle. It seems only fitting for this painting to be my painting of 2010. In case you missed it, my blog posts on my trip to Sweden are HERE and HERE. It was also published in the October issue of Canada’s Horse Sport Magazine. 2011: Get your Pink ON and Less is More..
Where 2010 I professed myself to be a Mountaineer, I am coming into 2011 feeling more like a Cave-Dweller. I say this with certain humour as some of my colleagues and I have coined a saying about being in ‘the cave’. We go in ‘the cave’ when we are overwhelmed with work or just need some silence to find inspiration. It sounds harsh, but I can assure ‘the cave’ is well furnished, coupled with copious amounts of coffee and usually wine at the end of the retreat in there. 😉 I’m spending some time in my cave in 2011 for two reasons: To create an Original series of works and complete outstanding client commissions. In order for me to pursue an Original series, I will be taking on limited commissioned work in 2011. As the famed architect Mies van der Rohe once said “Less is More”. It is very difficult to say no to commissioned projects. I can assure you, I do love this work and I am blessed with fantastic clients. However, with my schedule filled with commission work, I am left with little to no time, to explore new ideas. I must pare back, in order to move forward. That said, I have a wait list for Spring 2011 commission works at present. Special priority will be placed with clients whose works wish to be featured in my series. This would mean the paintings would have to allow for a certain amount of creativity beyond a traditional portrait painting and incorporates the forecast colours in it’s palette. If you are interested in commissioning a portrait for 2011, please email me jennifer@jennpratt.com to discuss. Last but certainly not least, two important news flashes that are bringing in 2011 with positive energy. These two paintings, Fleur and Hindquarter Study are featured in the February issue of Canada’s Style at Home Magazine, High/Low Feature Article. They owned by Editor in Chief, Erin McLaughlin. Thank You Erin, for your support and friendship over the years. 🙂 It’s on new stands now, so be sure to get yourself a copy. Finally, February 24th I am returning to Sweden for one week to check out Eurohorse Fair, the Gothenburg Horse Show and visit with my Swedish friends. I will be blogging back about my adventures there, here and on my Facebook Page. I hope you will tune in then. Toast to 2011, thank you to my readers, clients and friends.